The International Gay Rodeo Association® (IGRA) is gearing up for its 31st Annual World Gay Rodeo Finals® (WGRF) in Albuquerque, New Mexico. Over 200 cowgirl & cowboy competitors, rodeo volunteers, officials, vendors, and spectators from all over the world meet in Albuquerque, NM October 20-22, 2017. Come early. Stay late. Check the WGRF website for event schedules and social activities. Gay rodeo is one of the most exciting and fun events in sports diversity. From traditional rodeo competition to “camp” team competition, and of course, the honorable Royalty competition. It’s a weekend of serious competition, long-time comradery, exciting entertainment, and lots of great fun – all while raising money for our beneficiary charitable organizations. Since the beginning gay rodeo has encouraged great competition in the rodeo arena with traditional rough stock, roping, speed, and camp (fun/drag) events (www.igra-wgrf.com/rodeo-events-%7C-described.) There is also a Royalty competition (think pageants and campaigns) where hopeful candidates are judged in categories such as: western wear, talent, horsemanship, interview and onstage question. So… what exactly is Royalty? 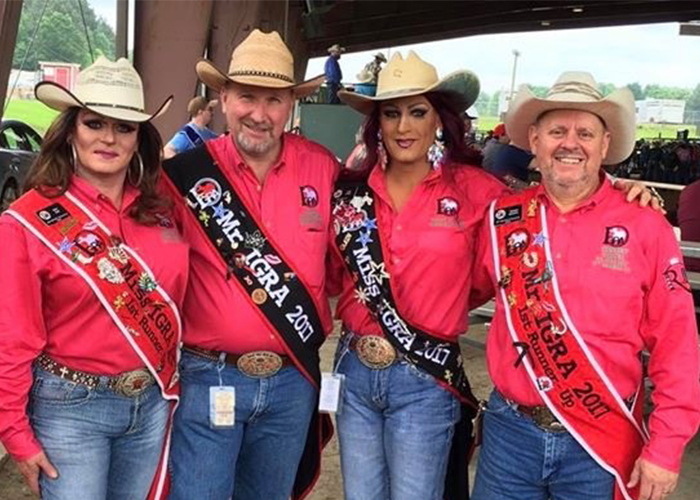 It’s similar to most mainstream rodeos where the rodeo queens are referred to as “Royalty.” But in IGRA, we have several different official Royalty positions filled with dedicated ambassadors promoting Gay Rodeo and the western lifestyle. These men and women can be seen wearing sashes or crowns and naturally draw lots of attention at the rodeo and outside of the rodeo arena where they attend a variety of events and fundraisers in their respective cities as well as rodeo-sanctioned venues in the host city of the World Gay Rodeo Finals. To rise to the level of IGRA Royalty – an International Title – a candidate must first win a Royalty position in their local Gay Rodeo Association and then compete for the International title at the World Gay Rodeo Finals. Many associations have Royalty positions consisting of “Mr.”, “MISS”, “Ms.”, and “MsTer”. Royalty positions are as follows: “Mr.” is a title typically held by cisgender male cowboys; “MISS” is a title typically held by men who are female impersonators; “Ms.” is a title typically held by cisgender women cowgirls; and finally “MsTer:” is a title typically held by male impersonators. Royalty, at the local, national, and international level are usually the ones asked to do take on a bulk of the fundraising for their local associations as well as the IGRA. Funds raised support Gay Rodeo across the country and local/national charity. Sometimes jokingly referred to as “Cash Cows,” Royalty is successfully in raising large sums of money for IGRA and affiliate associations. Many of our honorable Royalty are accomplished rodeo competitors, as well!